Tecsun Radios Australia has set up a Software defined radio (receiver) in Goulburn, a rural town in NSW, Australia. It’s a quiet location for radio “noise”, far away from high density population and the accompanying RF noise generated. You can listen to the Tecsun Radios Australia SDR here. The SDR itself is called a “KiwiSDR” and is a commercially available unit, costing around $500. The Kiwi SDR compared to others has 2 advantages: (1) it allows the user to observe the entire shortwave spectrum in one screen, and (2) it can easily be connected to the internet to allow remote operation. Other SDRs only receive a narrow portion of the radio spectrum, and require extra equipment to connect to the internet. With the Kiwi SDR, it is easy to remotely identify that a signal exists from the “waterfall” display and then accurately tune and receive it. The SDR is connected to an onmidirectional wideband antenna, so that all signals across the shortwave band can be equally well received (however this is dependant on signal propagation at different times of the day). The antenna itself is a modified Tecsun Radios Australia discone, with some of the radials removed to give the antenna a higher angle of radiation. The central active element has been replaced with a 3 meter spiral wound helical element. This simulates a much longer piece of antenna wire needed for lower frequency reception. The antenna has been located as far away from man made noise sources as possible, is fed with special double shielded coaxial cable and a variety of matching transformers and attenuators, to ensure local stations do not overload the sensitive “front end” of the SDR. Careful attention has also been paid to the grounding of the antenna. The Kiwi SDR can be used to receive AM, AM Narrow, USB, LSB, weatherfax, CW (Morse Code) and DRM signals (when a suitable decoder is used). Or, simply logon to the SDR (go to https://sdr.hu/ for a worldwide list), select an SDR located close to the transmission source you’d like to listen to, select AM mode and the desired frequency. 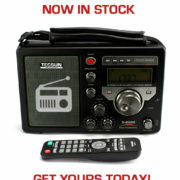 Have you tuned into the Tecsun Radios SDR? Tell us in the comments below where you’re tuning in from and what you listened to!